Good Shepherd is dedicated to constant improvement—improvement in quality of care and service, improvement in patient and staff safety, improvement in efficency. We seek to do more things for our patients, to do them better and more promptly, and to do them in a fiscally responsible manner. Our organization is never satisfied with the status quo. To improve, we need to be able to carefully define and measure the current situation, or else we cannot say whether things improve or only just change. Good Shepherd submits information to the U.S. Centers for Medicare & Medicaid Services to participate in their Hospital Compare program. It shows compliance with measures for common hospital admissions for heart failure, a heart attack, pneumonia, stroke, venous thromboembolism prophylaxis (blood clot), immunizations and ER throughput, and surgical infection prevention. Note that some data are too small to show, and much of what does show are few cases. You may view this data at www.hospitalcompare.hhs.gov and www.OregonHospitalGuide.org. Good Shepherd is eager to hear what the community we serve thinks about how we’re doing. We use the NRC Picker program to measure patient satisfaction in all hospital service areas. The numerical satisfaction levels and your comments are often the first step toward changes in the way we care for you, and we appreciate your taking the time to help us serve you better. Patients are contacted after their discharge and asked to participate in a brief phone survey regarding their stay. There is an opportunity for comments after the formatted survey is completed. 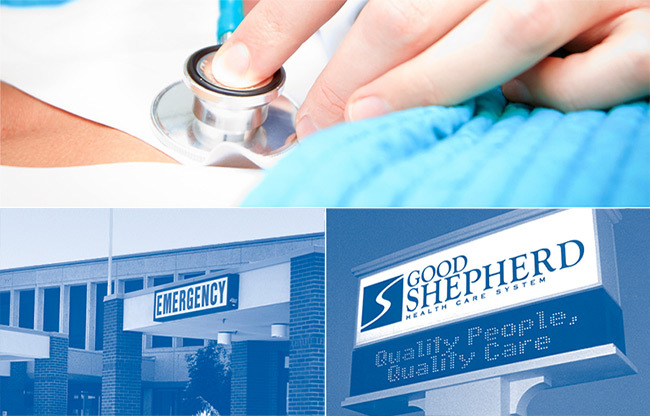 We will soon be including Good Shepherd Medical Group to our survey process. The Oregon Association of Hospitals & Health Systems maintains a database (called PricePoint) in which Good Shepherd participates that shows a comparison of charges among Oregon hospitals for most common procedures.